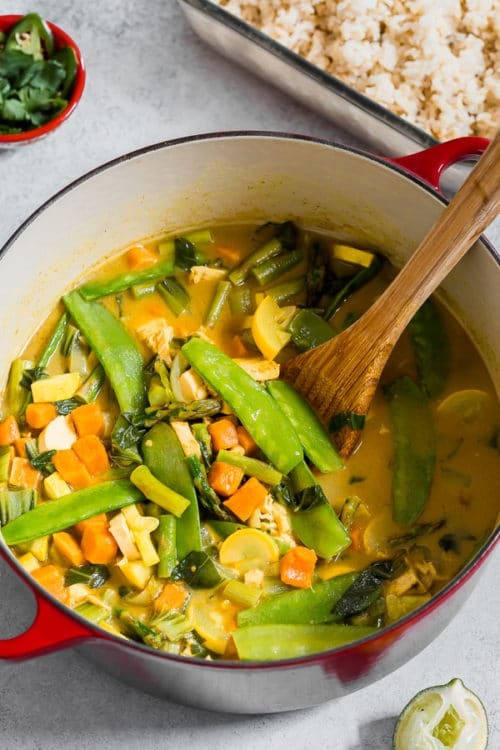 30-minute one-pot coconut curry loaded with spring vegetables – super easy and super quick dinner recipe with layers of flavor. 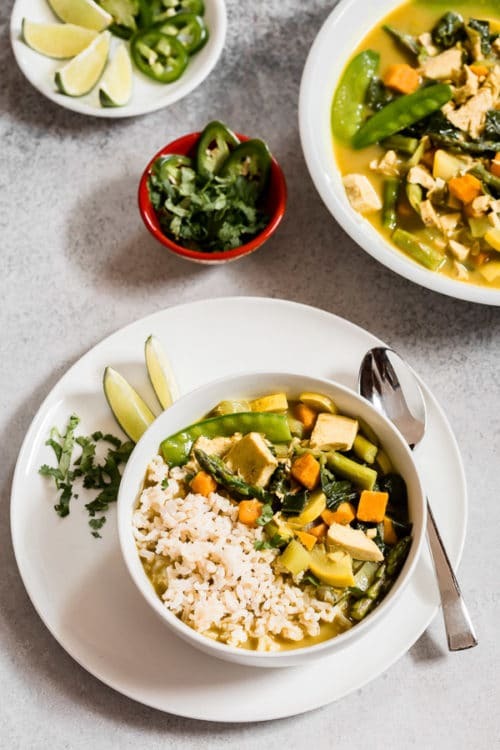 Use this coconut curry recipe as a guide and feel free to adjust the ingredients to your taste. 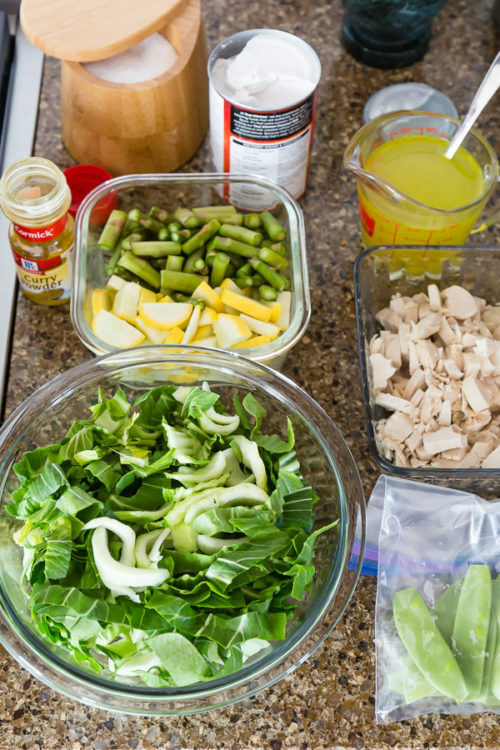 Since this curry cooks really quick, I recommend to prep everything before you start cooking. Heat a dutch oven over medium high heat. Add oil and heat it for 30 seconds. Add cubed sweet potatoes and cook for about 2 minutes, stirring occasionally. Add curry powder and cook for another minute or so, stirring frequently to avoid burning the spices. 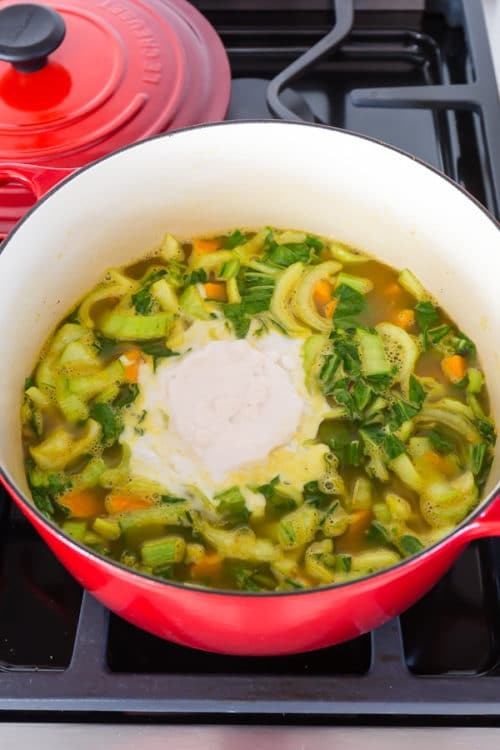 Pour chicken stock and salt. Stir everything, deglazing the bottom of the pan. Bring it to a boil. Add bok choy and coconut milk. Mix well and bring it to a boil. 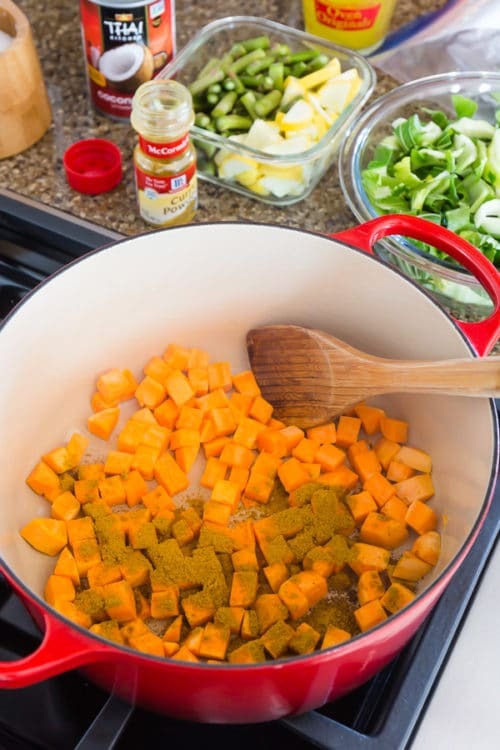 Taste sweet potato and if it’s tender, add squash, asparagus and chicken. Cook for a minute or two, until chicken is heated through. 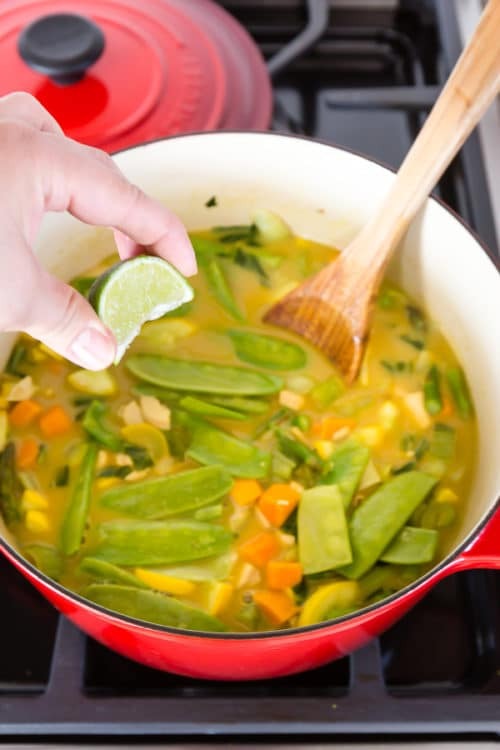 Squeeze juice of half a lime and serve over steamed rice with lime wedges and cilantro. Note 1: The amount of curry powder depends on the intensity of your curry powder. I use McCormick curry powder and about 5 teaspoons work perfect for me. I suggest start with 2-3 teaspoons and add more to taste. 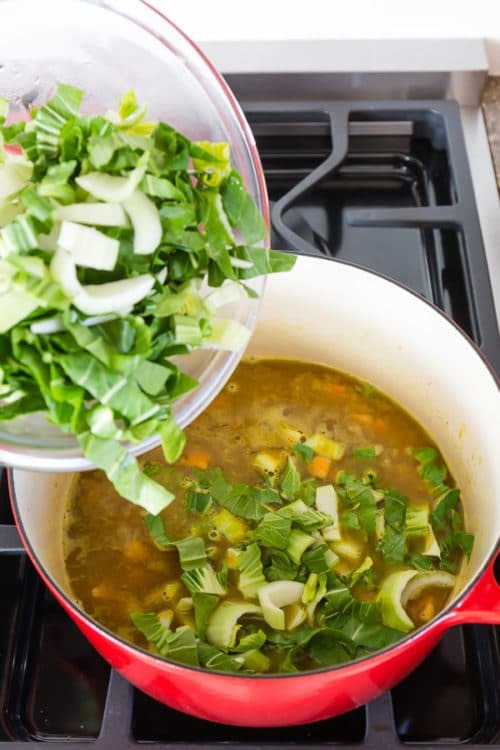 Note 2: You can substitute ½ napa cabbage for bok choy. 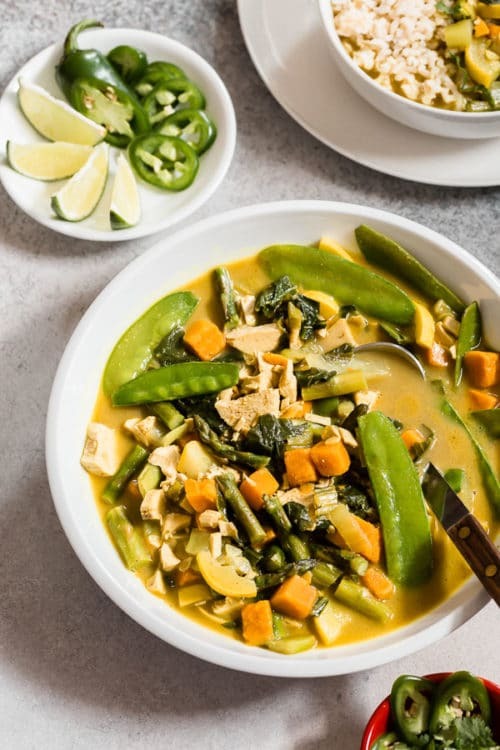 This coconut curry recipe is light and flavorful meal loaded with beautiful spring vegetables, like bok choy, asparagus and snow pea. Layers of flavor and texture makes this dish a family favorite! The recipe is very versatile too. You can easily change things up. Use it as a guide and feel free to adapt it to your taste. As mentioned in the recipe, I use McCormick curry powder and it’s a staple in my pantry. It’s a wonderful mild curry as far as heat, BUT it’s very aromatic and flavorful. Even my toddler can eat this curry! Toasting curry powder awakens the spice, making it more aromatic. 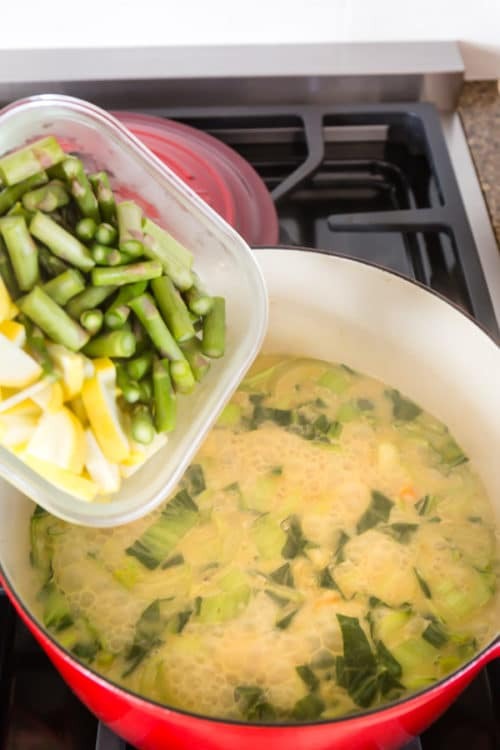 Chop the vegetables in advance and store them in airtight containers in the fridge. 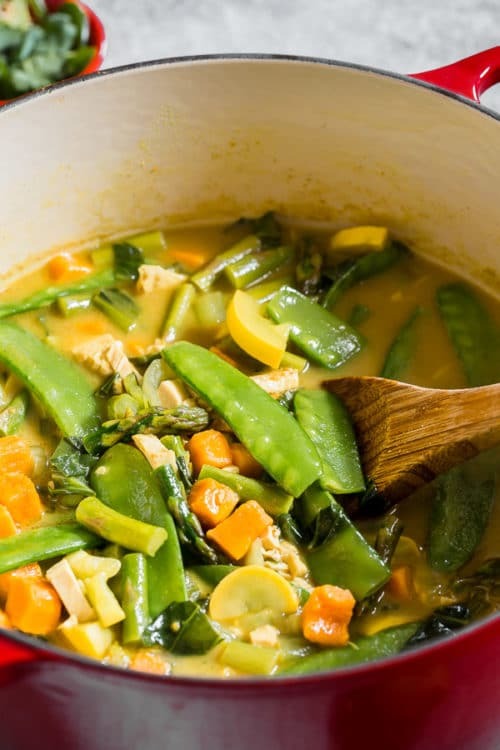 Then it’ll only take 20 minutes to cook this coconut curry. Since this curry comes together super quick, it’s important to prepare all the ingredients in advance. 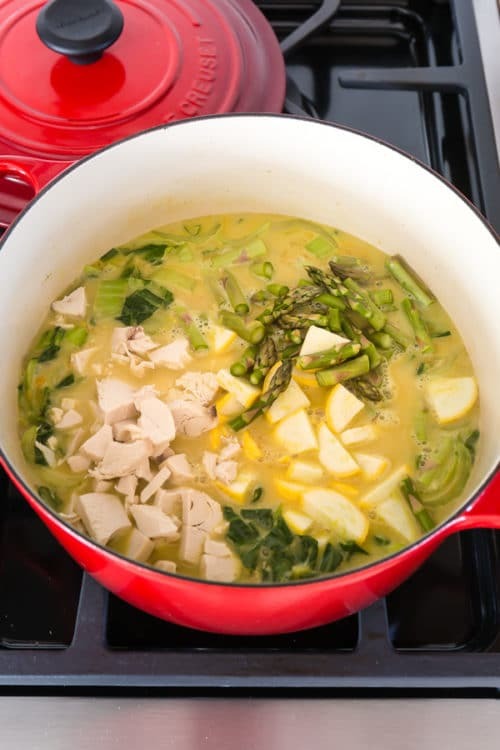 Don’t cook the curry for too long after adding asparagus, squash and snow pea to preserve the texture. Leftover rotisserie chicken is perfect for this dish. Squeeze of lime to brighten the flavors! Serve this curry over plain rice, both white and brown rice works great. Also cooked buckwheat groats are great as a gluten-free version. 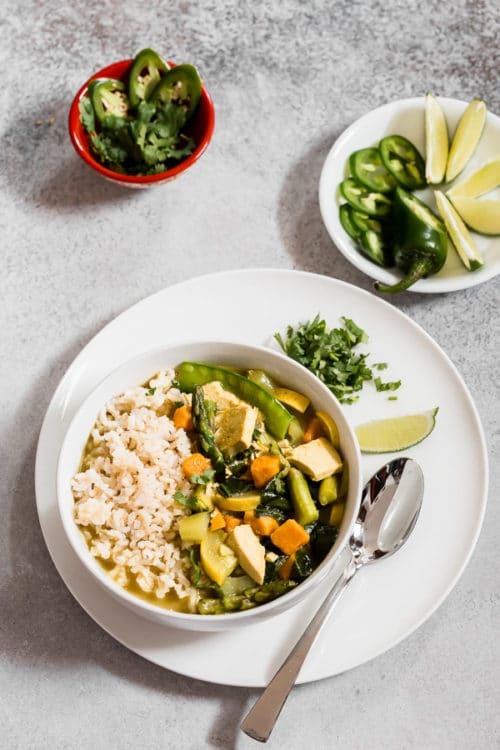 This’s truly delicious weeknight meal packed with nutritious veggies and loaded with aromatic curry sauce.